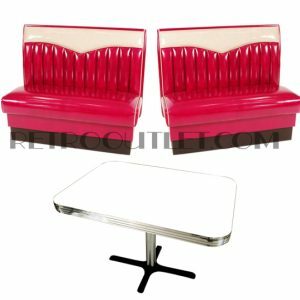 The Belair Diner Booth Set features two 44″ Single Benches that are fully upholstered with a simple economical, smooth inside back and 36″ overall height with no top cap. Available in a wide selection of standard and premium vinyls and laminates. As pictured, upholstered in upgraded Burgundy (Red) Zodiac with Silver Zodiac Piping. Table has standard laminate with a Classic “B” Chrome Column Base. Please allow 4-5 weeks for production of the BelAir Booth Set in your choice of vinyls.